Come eat lunch with us! 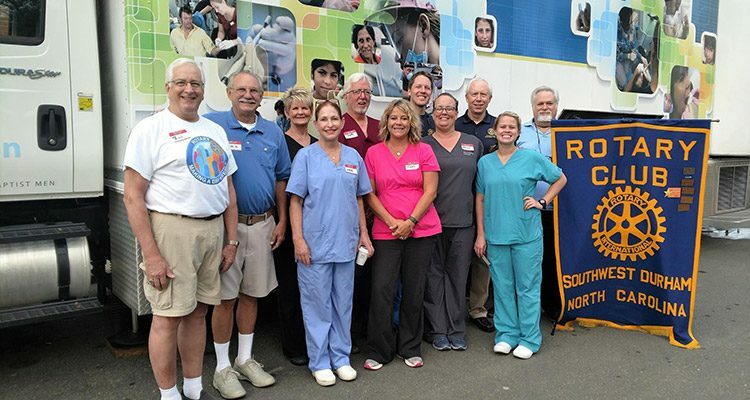 On July 28th, Southwest Durham Rotary Club sponsored a free dental treatment day at Urban Ministries of Durham. Five Rotarian dentists — Dr. Linda Levin, Dr. Mike Richter, Dr. Geoff Cunningham, Dr. Jim Hoke and Dr. Brent Blaylock — and their employees provided no-cost treatment for clients of Urban Ministries, using a mobile dental truck that has been adapted for dental treatment by the North Carolina Baptist on Mission. Non-dentist volunteers also helped check in patients, take blood pressure and review medical histories. More than 30 patients were provided dental care worth more than $28,000. 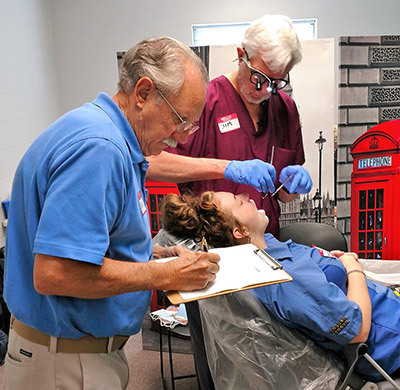 Dental Day was completed in honor of Dr. Evers Airall, DDS, a longtime member of Southwest Durham Rotary Club and 20-year veteran of the U.S. Army Medical Service, who practiced dentistry for three decades. He died earlier in 2017. The day was a huge success, and our Rotarian dentists are planning another Dental Day to take place in November.